Los Angeles police officers Brian Taylor (Jake Gyllenhaal) and Mike Zavala (Michael Peña) have everything to live for. They love their jobs, and have racked up a number of commendations in their still young careers. They’ve also formed an unbreakable bond with each other that transcends mere friendship. Things go horribly bad when a traffic stop turns up a cache of exotic weaponry and drug loot. The bust brings Taylor and Zavala even more glory, but also puts them on the radar of a vicious Mexican drug cartel. When the cartel places a green light on them, they find themselves on the front lines as never before. 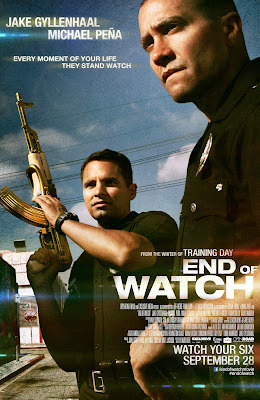 End of Watch is the latest police drama from writer/director David Ayer, the scribe behind Training Day. This film covers similar territory, but the focus is placed on L.A.’s finest as opposed to L.A.’s most disgraceful. It’s not done as a typical thriller with an elaborate plot. Yet another crucial difference is that it is the first of Ayer’s films (and perhaps the first cop flick ever) to employ the “found footage” aesthetic. That approach allows for a variety of clichés and genre tropes to be viewed through a fresh lens. It also allows Ayer to craft a harrowing love letter to the boys in blue. The found-footage conceit is worked conveniently into the plot. Officer Taylor is working on project for his film class, and carries around a digital camcorder while on the job. He also wears a miniature digital camera that he can pin to his uniform. He requires Zavala to do the same, so as to get as much coverage as possible. I’m not sure as to the plausibility of all this, as I would assume that every police department across the country has strict policy regarding such things. Ayers smartly makes Taylor’s class project into a bone of contention with his coworkers and superiors. The antagonists of the piece follow suit. A group of Mexican gangbangers carries a camcorder to document their various crimes for posterity. Not the smartest thing in the world, but it’s definitely believable given the penchant that gangsters often have for self-glorification. At times, the film violates the rules of the found-footage genre by incorporating omniscient shots that are not the product of any of the character’s camcorders (or security cameras, news footage, etc.). These “cheats” are noticeable, but not distracting. Like many modern police procedurals and cop shows, End of Watch emphasizes a certain brand of gritty realism. It comes by this via the cinéma vérité shooting style, as well as the dialogue and performances. Athens Park Bloods member turned technical Advisor Cle Shaheed Sloan aka “Bone” makes a memorable appearance. Fans will know him from his turns in Training Day and Brooklyn’s Finest, as well as his documentary Bastards of the Party. Here, he plays a key role in one of the film’s single best scenes. Sloan’s presence lends an air of authenticity to the proceedings. The same can’t be said for the Mexican gangbangers, who feel exaggerated to the point of caricature. The film shows them as nothing more than hateful, bloodthirsty troops. To a degree, this does add to tension. These guys clearly don’t play, and are a clear threat to anyone wearing a badge. In recent years, film critics and bloggers have often lamented how genre films have come to resemble video games. They often fail to mention that this doesn’t have to be a bad thing. In its most tense and frightening moments, End of Watch takes on the ambience of a good action game or first person shooter. This is especially true during the riveting climax, in which Taylor and Zavala are pinned down by enemy fire in an apartment complex. It’s one of the rare instances in which the chaos cinema aesthetic is not only appropriate, but is employed to optimum effect. The film’s single greatest assets are Gyllenhaal and Peña. Their sense of brotherhood is palpable. Never once does it feel sappy, forced, or melodramatic. In their hands, the profane and witty banter provided Ayer comes to life. End of Watch points out a bold new direction for modern police procedurals. Like The Raid: Redemption, it borrows from the survival-horror playbook. In this sense, the horror is much more real and immediate. The bad guys aren’t zombies or high powered martial artists. They are the kinds of thugs that populate just about every city in America. The heroes in this world suffer losses of a variety that are often impossible to recover from. End of Watch may cover familiar territory, but it lingers in the mind far longer than most other films of this type. It’s easily David Ayer’s best effort yet.